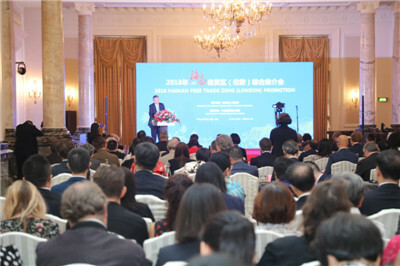 On July 13, 2018, Ambassador Liu Xiaoming attended the 2018 Hainan Free Trade Zone (London) Promotion held at the Landmark Hotel and delivered a keynote speech. Mao Chaofeng, Executive Vice Governor of Hainan Province, Sir Douglas Flint CBE, the UK Treasury's Belt and Road Envoy, the Rt Hon. 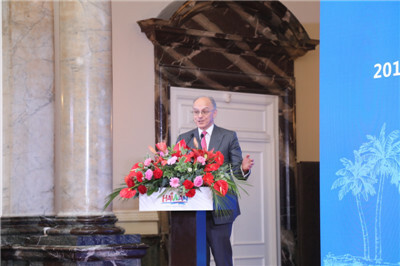 Lord Sassoon FCA, Chairman of China-Britain Business Council (CBBC) and Wang Changshun, Chairman of China Southern Airlines Group attended and addressed the event. Nearly 150 people were present, including William Godwin QC, Director of Great Britain China Centre, Dolores Kelly, Chairperson of All-Party Group on China of Northern Ireland Assembly, Sun Yu, Chairman of China Chamber of Commerce in the UK (CCCUK) and representatives from the political, business, tourism, cultural, educational and media sectors of China and the UK. Ambassador Liu noted in his speech that this year marks the 40th anniversary of China's reform and opening up. It is also the 30th anniversary of the establishment of Hainan Province and Special Economic Zone, the largest and only provincial level SEZ in China. Last April, President Xi Jinping announced that Hainan was to establish a pilot free trade zone and explore the building of a free trade port. This is a demonstration of China's renewed courage to open up wider to the world, a new experiment with deeper reform on all fronts, and a fresh impetus for the opening up and development of Hainan. Speaking of the most popular sights of both countries, the Ambassador said, "Here, the British people call theirs 'Land's End'. In Hainan, people call theirs 'End of Sky and Ocean'. Both 'End's have breathtaking views. Both peoples have inclusive mind, broad vision and pioneering spirit." He hoped that people from all walks of life in China and the UK could work together to deepen cooperation, as the building of the pilot free trade zone and free trade port in Hainan could provide a new engine, the three pillar industries of Hainan could be the priority areas, and the Belt and Road Initiative serves as a good platform for such cooperation. Through such cooperation, China and the UK could contribute to the "Golden Era" of their relations. 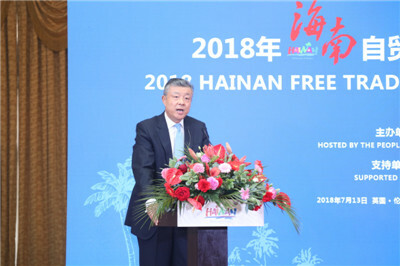 Executive Vice Governor Mao Chaofeng noted in his speech that Hainan is China's only tropical island province, in addition to being the largest Special Economic Zone and the most popular tropical beach resort. Since its becoming a province, Hainan has grown from a frontier island to an important gateway for China's reform and opening up. On April 13 this year, at the celebration of the 30th Anniversary of the Founding of Hainan Province and the Hainan Special Economic Zone, President Xi Jinping announced that the CPC Central Committee has decided to support Hainan in turning the whole island into a pilot free trade zone and gradually exploring and steadily promoting the establishment of a free trade port with Chinese characteristics. Hainan has unique advantages, including its warm climate, fresh air, beautiful scenery, good facilities and diverse culture. It will focus on opening up wider, continuously optimizing its business environment, and actively developing its tourism, medical services, tropical agriculture, exhibition industry and other special industries to enhance its internationalization. Mao welcomed people to Hainan for investment, holiday and sightseeing, cultural and ethnic experience. Hainan Province will offer great opportunities to all who are ready to take part in the building of Hainan Free Trade Zone. Sir Douglas said that, Chinese government's decision to build a pilot free trade zone and a free trade port in Hainan shows China's commitment to further expand its opening up and boost the Belt and Road Initiative. It also means that investments in Hainan will enjoy favorable policies, infrastructures and other corresponding measures. As the UK Treasury's Belt and Road envoy, he is willing to work for better understanding, joint exploration of opportunities, and win-win results between China and the UK. He wished Hainan and the UK success in their cooperation. 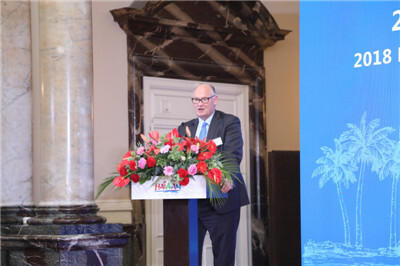 Lord Sasson said that, in recent years, Hainan and the UK have enjoyed increasing exchanges and cooperation. The newly launched Sanya-London direct flight and visa waiver policy will facilitate the people-to-people exchanges between the two countries. The British media also actively promoted the opportunities that the Hainan Free Trade Zone brought to the UK. With its natural endowment, well-grounded infrastructures, and huge opportunities arising from the development of the free trade zone, tourism industry, medical services, high-tech sector and the Belt and Road Initiative, Hainan makes a good development partner for the UK. CBBC will support British business to have close cooperation with Hainan and share its opportunities of development. A video about Hainan was shown at the promotion. 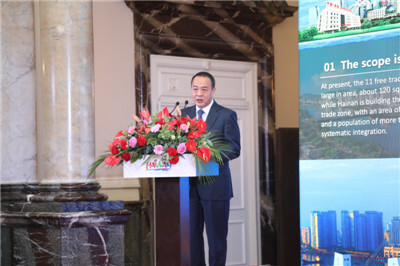 Lu Yong, Director of Hainan Provincial Department of Commerce, Chen Shaoshi, Deputy Director of Hainan Health and Family Planning Commission, and Sun Ying, Director of Hainan Provincial Tourism Development Committee, gave presentations respectively to introduce Hainan. Julia Morley, Chairwoman of the Miss World Organization, announced that Miss World 2018 Final will be held in Sanya. The guests at the promotion were given information packs about Hainan and its development and changes in Hainan. This offered a glimpse into China's achievements after 40 years of reform and opening up and the tremendous opportunities that will become available as China further expands its opening up. Enthusiasm for visiting Hainan and engaging in cooperation runs high.